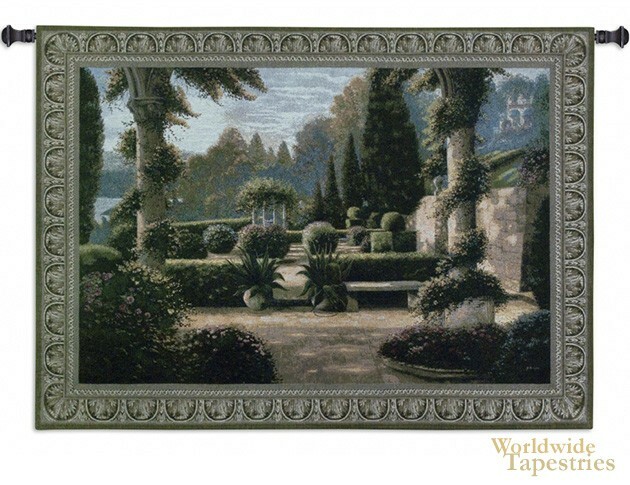 This tapestry "Parterre De La Vierge" which means Virgin Gound, shows a garden scene from a work by Betsy Brown. In this tapestry we see intricate green details of all the folaige of the topiary garden, from greens to red greens. The use of light is beautiful, as you can see the afternoon sun coming through the branches of the taller trees and creating a golden light on the ground. A work reminiscent of Italian and Mediterranean gardens on the coast, hinted at by the sea in the distance. This landscape tapestry is backed with lining and has a tunnel for easy hanging. Note: Tassels and rods where pictured, are not included in price. Dimensions: W 74" x H 53"